Anwar Ali and Prabsukhan Singh Gill have many things in common. 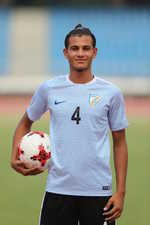 Both hail from Punjab and are part of India’s Under-17 football World Cup squad. The two honed their skills at the All India Football Federation’s (AIFF) regional academy in Goa during their days as U-14 footballers. Both belong to families with agrarian background and started their soccer journey on the muddy fields of their respective villages. However, there’s one thing which makes their bond even stronger. It’s the desire to make their parents proud by showcasing to the world their footballing abilities. India, who have USA, Colombia and Ghana in their pool, are not favourites to reach the knockout stage. Still, Ali and Gill just want to savour this incredible journey — wearing the national team’s colours and playing in front of a packed stadium. “This is something surreal happening to us. This is the biggest platform of our nascent career. And we want to make every opportunity count,” Ali told The Tribune. Ali took up football because his father never got to realise his own potential — owing to the family’s financial condition, Ali’s father couldn’t pursue his football dreams. “My father used to play football in our village Adampur in Jalandhar. The elderly people in my village fondly remembered his attacking instincts while breaching the rival’s citadel. But due to some financial issues, he couldn’t seriously pursue his football career,” recounted Ali. “However, he always encouraged me to pursue football as a career. He would tell me that ‘what I couldn’t achieve, I would like to see you fulfil those dreams’. Whatever I am today is because of my father. This World Cup is a chance to show to him that his son has the ability to become the country’s leading footballer. He would certainly be proud of my achievements one day,” added Anwar, who is a central defender. Gill, who plays as a goalkeeper, also didn’t have to look too far for inspiration. His elder brother, Gursimrat Singh Gill, plays for the NorthEast United FC in the Indian Super League. However, after playing for India’s U-16 and U-19 teams, Gursimrat has found it difficult to break into the senior side. “One day, I was having a chat with my brother. He told me that this World Cup didn’t happen during his time and now he’s struggling to garner the required attention,” Gill said. “He knows this event could put me on the top. A good showing in the World Cup is a stepping stone to becoming a part of the senior national team. My ultimate dream is to represent India at the senior level and to achieve what my brother couldn’t. I want to earn name and respect through football,” said Gill. 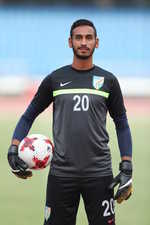 In 2013, Ali joined the Mahilpur Academy and later got selected for the AIFF academy in Goa. However, things didn’t unfold as planned and he was excluded from the academy in 2015 due to non-performance. The same year, he joined the Minerva Academy in Chandigarh and, since then, there’s no looking back. This year, when Minerva FC defeated the U-17 India team 1-0 in a friendly match, coach Luis Norton de Matos was impressed by Ali’s defensive abilities. He drafted him into the World Cup squad and Ali is now waiting for his big moment to arrive. For the record, three of Ali’s Minerva teammates are part of the WC squad — Jackson Singh, Mohammad Shahjahan and Nongdamba Naorem.